Jenean A. Castillo, Ph.D. is the Director of the federally funded Leadership Education in Neurodevelopmental and Related Disabilities (LEND) interdisciplinary training program at the Westchester Institute for Human Development (WIHD). The LEND program at WIHD is one of 52 university-affiliated interdisciplinary leadership training programs nationally. The program helps graduates, post-graduates, family members, and self-advocates develop leadership knowledge and skills to work with and on behalf of children with disabilities and other special health care needs and their families. 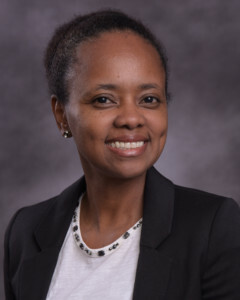 Dr. Castillo also serves as WIHD’s Diversity and Inclusion Coordinator, actively supporting and enhancing WIHD’s efforts to promote cultural and linguistic competency to ensure equitable outcomes for children with disabilities and special healthcare needs and vulnerable populations. Dr. Castillo is an Assistant Professor of Practice at the Center for Disability and Health in the School of Health Sciences and Practice at New York Medical College. She is the course director of the 15-credit Graduate Certificate in Children with Special Health Care Needs, which is offered as a component of the LEND Training Program. Previously, Dr. Castillo was the Assistant Director of Child Welfare Services at WIHD. She was a former LEND fellow, and then a faculty member and course director in the LEND program. Dr. Castillo is a New York State Licensed Psychologist. Dr. Castillo’s research activities have focused on promoting the health and well-being of children with special healthcare needs or disabilities and vulnerable populations. Her research activities include ongoing program evaluation of the Every Family Counts (EFC) Aftercare Program, which she co-developed and previously managed. The EFC Aftercare Program provides intensive in-home and community-based services to families reuniting after foster care placement in order to maintain safety and permanency. Research activities have focused on examining program outcomes, including preventing foster care re-entry and promoting positive parenting skills, and cost effectiveness, looking at program successes against program costs. Ongoing program evaluation of the program’s outcomes and effectiveness has included conducting focus groups with caregivers and assessing family functioning with the goal of promoting successful family reunifications. Other research that has focused on the successful outcomes for children who have experienced foster care include exploring the psychological profiles of children in foster care in order to better identify and meet their needs. This research examines the developmental outcomes of children in foster care, including cognitive, behavioral, educational, social, and adaptive functioning. Areas of focused thus far have included exploring the adaptive behavior of children who have been physically neglected, understanding the cognitive abilities of children who have experienced various forms of maltreatment, and studying the impact of trauma symptoms on children’s functioning. Findings have informed the assessment and intervention processes in the delivery of services for this vulnerable population. Additional research designed to promote healthy functioning of children in foster care have focused on the prevalence of enuresis in children in a foster care population, examining associated risk factors and identifying tips and strategies to better support foster children and their caregivers. Dr. Castillo’s research has also focused on promoting healthy development of young children. She completed an evaluation for a federally funded program, Project LAUNCH (Linking Actions to Unmet Needs in Children’s Health), designed to ensure children birth to age eight are meeting their physical, social, emotional, behavioral, and cognitive milestones in order to be successful in school. The evaluation project focused on assessing children’s school readiness skills, including a particular focus on children presenting with special healthcare or learning needs. Dr. Castillo mentored two projects focusing on this evaluation, each of which was successful in receiving an award for outstanding research, recognizing the each projects’ achievements and contributions to research and practice. Most current research is interested on identifying organizational strengths and areas for growth in order to advance cultural and linguistic competence. This includes implementing an assessment process to provide a systematic approach to planning for and incorporating cultural and linguistic competency throughout every aspect of the organization’s functions. More specifically, the research project is focused on assessing strengths and areas for growth in order to advance cultural and linguistic competence to reduce health disparities and promote health equity for individuals with developmental disabilities and their families through an assessment that includes staff, community stakeholders, and clients and/or family members as well as a demographic review of those served and the catchment area. The results of this assessment will be used to inform strategic efforts to advance a culturally and linguistically competent organization. Castillo, J., Faison, J., Hampton-Risucci, J., McGinnis, M., & Trapasso, K. (2017). Posttraumatic symptomatology profiles of physically neglected children. Poster accepted for presentation at the 2017 annual conference of the Association of University Centers on Disabilities. Castillo, J., Cunningham, D., Elwell, A., Eshel, R., & Freyer, M. (2016). Evaluating the efficacy of a post-foster car eprogram. Poster accepted for presentation at the 2016 annual conference of the Association of University Centers on Disabilities. Endrikat, E., Viezel, K.D., & Castillo, J. (2016). Posttraumatic symptomatology profiles of physically neglected children. Poster accepted for presentation at the 2016 annual convention of the National Association of School Psychologists. Viezel, K. D., Davis, A. S., Miller. G. & Castillo, J. (2014). Evaluating the Relationship between Visual-Motor Integration and Intelligence in Maltreated Children. Poster presented at the 2014 conference of American Academy of Pediatric Neuropsychology. Davis, A.S., Holmes Finch, W., Viezel, K. D., Mion, A. M., Hoover, K.L., Endrikat, E.G., & Castillo, J. (In Submission). Visual Motor Integration and Intelligence in Children with a History of Physical Neglect. Viezel, K.D., Freer, B., Castillo, J. A. Lowell, A. (2015). Cognitive abilities of maltreated children. Psychology in the Schools, 52(1), 92-106. Viezel, K. D., Lowell, A., Davis, A. S., & Castillo, J. (2014). Differential Profiles of Adaptive Behavior of Maltreated Children. Psychological Trauma: Theory, Research, Practice, and Policy, 6 (5), 574-579. McDonald J.; Frank, D. M.; Samuels, M.; & Castillo, J. (2003). Categorical induction as hypothesis assessment. The Psychological Record, 53 (1), 121-142.